Designed for the most serious of target shooters. 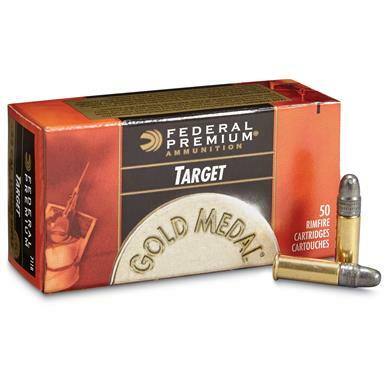 Federal Subsonic Gold Medal Target, .22LR, LRN, 40 Grain, 50 Rounds is rated 3.4 out of 5 by 19. Rated 2 out of 5 by panzerwolffen from These are not subsonics 1080 muz velocity but for some reason they shoot extremely loud suppressed.No misfires, feed good, but whats the point of 1080fps advertisement if they make that "pop" from any barrel length. Rated 3 out of 5 by Sup G from So so Works fine in my Ruger 10/22 but not in my S&W 22 Compact. FTE issues. I won’t buy these again. Rated 4 out of 5 by djunkins from Supersonic in my 20/22 Good ammo. Reliable. Cycles my semiautos just fine. But in 16” barrel the round goes supersonic. Not so, of course, with my pistol. I knew 1080 FPS might well go super in s rifle, but for now I’ll reserve this otherwise excellent ammo for pistol use. Good price here too, BTW. Rated 5 out of 5 by DooDack from Great price, good ammo I like this ammo and it's great for plinking around. I use it in my Mark II and my Remington bolt action rifle with no issues. Once in a while a shell will jam a little in the Mark II but that happens with any ammo in that gun. I'm completely satisfied with this product. Rated 5 out of 5 by DesertJoe from Best training-for-accuracy ammo for the money! I shoot NRA/IHMSA Smallbore Pistol Silhouette matches with this ammo, and it does a fine job in a MKII & a S&W 2206. Enough energy to drop the rams with an above-center hit. Predictable, consistent trajectory from lot to lot. My Contender likes it, too.Haven't tried it in a semiauto rifle yet, but it's very accurate in all my single shot squirrel guns. Rated 1 out of 5 by jhjak from Gold Medal target 711B I have just purchased three cases of Federal Gold Medal Target 711B based on the use of earlier 711B ammunition used at our local shooting range. The older range ammunition cycles my target pistol flawlessly. The ammunition recently purchased fails to inject a new round or jams with a case in the slide about every other shot from clips loaded with five rounds.Both sets of ammunition are labeled as 711B but there are slight differences in the printing and colors on the boxes. A check with other league shoots produced reports that Federal Gold Medal Match 711B quality has deteriorated of the last two years.I would appreciate your comments on what is happening with 711B ammunition and how to recognize the substandard versions you are marketing. Is someone counterfeiting your ammunition? Rated 1 out of 5 by Jagermeister from Constant Bought a brick (500) a week ago. Shortly after took 100 rounds to the indoor pistol range. Shooting a Colt 1911 Gold Cup Trophy. Repeated fail to complete the cycle. This ammunition does not have enough recoil to move the slide back far enough to clear a spent shell let alone carry a new cartridge forward. Good thing I had enough sense to pack another hundred, these being Remington Bucket of Bullets. Not one cycle failure or stove pipe out of the latter.I will blow the rest of the brick off in my revolver. Not sure if it will cycle an auto loading 22 rifle.Further down it asks how often I use this product. FWIW, I shoot weekly, but not always this ammunition. Of course it's not likely I will buy any again.